Nice has its fair share of international chain stores, but there's also a good selection of quirkier, more interesting shops and stores if you know where to look. You'll find the most interesting fashion in the small boutiques that populate Vieux Nice, the cheapest fashion on ave de la Republique and high-end shops on rue de Paradis. Here is a selection of shops that are currently attracting both serious shoppers and recreational window-shoppers. It's a boutique, snack-hall, grocery store and general counter-cultural happening that aims to showcase organic, local products and clothes made by local creators. Watch for poetry readings, concerts and other events. Previously-loved garments are honoured here from vintage clothing to more recent acquisitions. Prices are most reasonable. Jewelry, sunglasses and every variety of garment from evening gowns to military jackets crowd this tiny space that has become an unmissable stop for the local fashionistas looking for unusual items. Look for the little stairway leading to the basement, also filled with goodies. 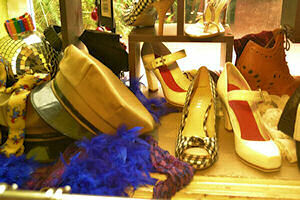 This vintage shop offers an array of stunning clothes and accessories from bygone days. Everything from evening bags to negligees are presented and at all price levels. Skateboarding is not just a sport but a philosophy, a style, a way of life. No one knows that better than Sébastien, the owner of this skateboarding store. After skateboarding around Europe he settled in Nice to bestow his knowledge and collection on the local skateboarding crowd. Skateboarding clothes and equipment for men and women cover a wide range of brands and budgets. And there's a special "skate room" to sell Four Wheels skateboards. More than just a store to buy shoes, Concept aims to be a sort of temple of shoe-dom. From classics like the first Adidas (1973) to fashionable Italian (Ash) and French (Comme ils disent) designers, you can find the highest of heels and the slouchiest of Birkenstocks as well as Kenzo, Schmoove, Converse and Nike. On a street dedicated to the finest of fine fashion, this new mega-store is an eye-popping display of style. With about 370 sq m spread over several levels and a minimalist decor, there's a lot of space to wander around admiring the artfully draped mannequins. Young urbans will appreciate the Boss Orange Label at affordable prices but fashionistas of all stripes will be ready to max out their credit cards to get one of the very attitudinal outfits.